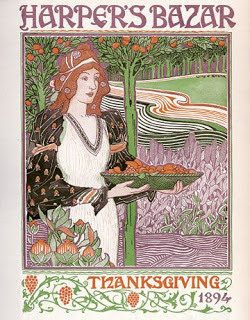 Introducing The Wine Atelier & Wine Picks for Thanksgiving!! I'd like to thank everyone for your patience while The Glamorous Gourmet undergoes some exciting changes and improvements. It's hard to believe the blog I began a few years ago to support the Junior League of Boca Raton's James Beard award winning cookbook, Savor the Moment has grown into a full-fledged website which will be fully functional very soon. Aside from the new site, the biggest change is the addition of The Wine Atelier & Club, our latest vinous endeavor. The Wine Atelier & Club is an online wine boutique, club and educational treasure trove born of a desire to provide you with access to the latest wine discoveries and trends from around the globe. The Wine Atelier also represents a shift in the way wine is typically sold. The word atelier means "studio" and, unlike with many other retailers, here, you’ll never encounter the daunting “wall of wine” navigable only by relying on critic's scores, a prayer and bit of good luck. Our passion is to help you “empower your palate” through education (the fun kind, I promise!) and sampling a variety of wines and styles from around the world. We find that when our clients learn not only what they like but why they like it, they can navigate the world of wine with confidence, understanding and enjoyment. We are here to provide you with unique, personalized assistance in selecting wines at virtually every price point. Please consider us your friend along this journey of vinous exploration! For this most American of holidays, why not serve home-grown American wines? Here are five selections that represent great values while also following a few of my favorite pairing principles that can help you avoid an acute case of Wine Pairing Paralysis (click here for more info). These selections have you covered - no need to tangle with the "wall of wine"! This lovely sparkler comes from the California incarnation of Taittinger Champagne and represents an excellent value given its stellar pedigree! Winemaker Eileen Crane (aka America's Doyenne of Sparkling Wine) is the most experienced Sparkling Winemaker in the United States. Crane was hand-selected by Claude Taittinger to not only develop Domaine Carneros's wines but also oversee the design and construction of the winery. 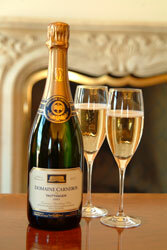 The 2008 cuvee is a delightful blend of 57% Pinot Noir and 43% Chardonnay. Approximately 9% of the cuvee underwent malolactic fermentation prior to blending. This sparkler has been aged for three years prior to release and is delicious now yet will also age beautifully in your cellar for a decade or more. 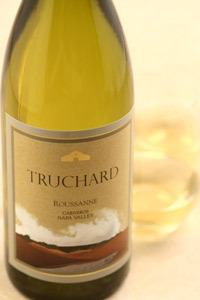 Truchard Vineyards began as a 20-acre parcel of land established in 1974 when Dr. Tony and Jo Ann Truchard came to the Carneros region of the Napa Valley. Over the past 31 years the Truchard Estate Vineyard has grown to 400 acres and in addition to making their own estate wines, the Truchards now sell grapes to more than 20 premier Napa Valley wineries. Roussanne is a white grape grown originally in the Rhône wine region of France, yet has shown great potential in New World regions such as California, Washington, and Australia. This wine has a kiss of oak and also underwent a partial malolactic fermentation resulting in lovely floral aromas of honeysuckle and fresh apricot highlighted with brioche and vanilla. The palate has a creamy texture with flavors of nectarine and Meyer lemon. Firm acidity provides a lengthy finish of citrus, mineral, and spice. Bill Foley founded Lincourt in 1996 in the Sta. Rita Hills region of Santa Barbara County. Today the Sta. Rita Hills AVA, established in 2001, is one of California’s well-respected, cool-climate, viticultural regions. This area is exposed to fog and coastal breezes from the nearby Pacific Ocean that create an ideal climate for growing cool-climate grapes such as Chardonnay and Pinot Noir. Unlike big, oaky Chardonnays, this wine is fermented entirely in stainless steel and is a blend of 98% Chardonnay and 2% Gruner Veltliner. It features lovely aromas of kiwi and citrus zest and the palate is crisp and minerally with notes of lemons and green apples. This wine is very versatile and makes a fabulous aperitif or pairing for a variety of cuisines. Owner and winemaker, Jed Steele has been involved in California's wine industry for 43 years. After starting some of California's best known wineries including Edmeades and Kendall-Jackson, he created Steele Wines which reflects his never ending fascination with many different varietals and vineyard locations. His approach allows him to maintain the practice of true craftmanship in the production of their small lot bottlings. Blaufrankisch (aka Lemberger) is a late-ripening red grape variety known for its ability to produce red wines with approachable tannins and spicy character. This wine is clean and crisp with aromas and flavors of black fruits and berries that complement notes of pepper, cherry and cinnamon. The Shooting Star Blue Franc also has soft tannins, medium body, great color and pairs well with a variety of cuisine. It has a beautiful label too! What's not to love about cashmere this time of year? Fred Cline founded Cline Cellars near Oakley, CA in 1982 and was responsible for preserving and restoring many ancient vine sites to their rightful condition as premier California wine lands. After relocating his winery to the Carneros region of Sonoma in 1991, a region planted largely to Chardonnay, Pinot Noir and Merlot, Cline pioneered the planting of Rhône varietals including Syrah, Viognier, Marsanne and Roussanne. The 2011 Cline Cashmere is a delightful and approachable blend of Mourvèdre, Grenache, and Syrah. This wine offers aromas and flavors of bright cherry, raspberry, chocolate and toast with hints of cracked black pepper and plum. It is a versatile reds that pairs well with a variety of cuisines. The Wine Atelier also offers a full range of Sommelier services including Wine Cellar Management and Consulting; Wine Tastings, Parties and Seminars for both private and corporate events; Wedding Consultations; and Food and Wine Pairings. 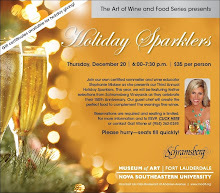 While The Glamorous Gourmet & Wine Atelier website is under construction, to purchase these or any other wines for your holiday dinners, parties or gifts please call 561-317-6663 or e-mail stephanie@theglamorousgourmet.com. 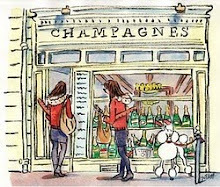 Mention this post and receive 10% off your purchase of a case of any of the wines mentioned in this post.